"The application of easy-on has allowed us to protect the train against future graffiti application, as well as ensuring the units' future appearance to the travel public is at the highest level. This is an exceptional product, and one which I would recommend to other transport operators. " Wild In Art - Christchurch Stands Tall - The giraffes have arrived! Urban Hygiene is proud to be a sponsor of Christchurch Stands Tall, the giraffes will be coated with easy-on protective coating and the maintenance contractor; Global Interiors will be using easy-off graffiti remover as the preferred cleaning product. Christchurch Stand Tall is a mass appeal public art project organised by the United Kingdom organisation, Wild in Art. More than 50 giraffes, each standing 2.5 metres tall, will be painted and decorated by local artists and planted in parks, streets and open spaces. 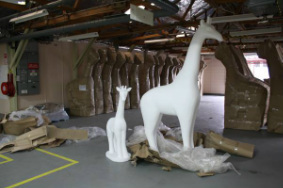 Christchurch schools will decorate another 50 baby giraffes. Each would be sponsored, and organiser Claire Cowles said many still needed support. Wild in Art has produced several other public displays. Liverpool has had penguins, Sydney had rhinos and Bristol hosted Gromits, from Wallace and Gromit. Cowles said each animal was chosen for the city visited and standing tall seemed appropriate for Christchurch post-earthquakes. All 100 giraffes would be on display for 12 weeks during summer and would then be auctioned off with proceeds going to charities like Child Cancer, Life in Vacant Spaces and Gap Filler. A trail and map would help the public to see each giraffe in place starting in November. 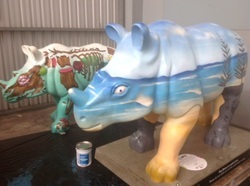 Project - to cover and protect the Koalas and Rhinos as part of a "Wild in Art" project in Australia. These fibreglass sculptures are individually designed and painted by local and international artists and then Stuart and the team from Osprey NSW applied easy-on to the finished sculptures before they were positioned on their trail. Any graffiti or marks were then easily removed using easy-off graffiti remover. All materials were provided by Osprey NSW. Wild in Art is coming to Christchurch soon..... Urban Hygiene NZ is proudly supporting this project - watch this space for more information! Project - When it came to choosing a coating to protect valuable open air exhibits, there was only one choice for Peter Smit. Having seen how well easy-on performed for the Elephant Parade in 2010 he chose easy-on for this project and was not disappointed with the result. Project - easy-on Anti Graffiti Coating was used to protect trackside control cabinets subject to regualar graffiti attack, making cleaning quick, safe, and simple. Project - easy-on Anti Graffiti Coating is used to protect areas not covered by CCTV due to privacy issues. To ensure the future appearance is at its highest level. Project - To protect 168 valuable GRP painted elephants on display in open public places for 2 months. Having worked together on previous parades in Amsterdam, London, Heerlen, Emmem, and Copenhagen, Elephant Parade knew easy-on was the first choice for Protective Coatings. Project - To improve a subway. There were over 120 participants involved. The mural project was completed in just 2 weeks. The result is an invigorating, colourful mural that has been exceptionally well recieved by the users of the subway. Urban Hygiene is proud to be associated with the wonderful work carried out by all those involved with theElephant.Parade. The Elephant’s are displayed in city centres around the World and people are invited to come down and interact with the parade. This year thousands of people descended on Heerlen in the Netherlands to see the spectacle and have their picture taken with the brightly coloured statues.